Easy Southern Chicken and Dumplings is classic comfort food and a true family favorite. 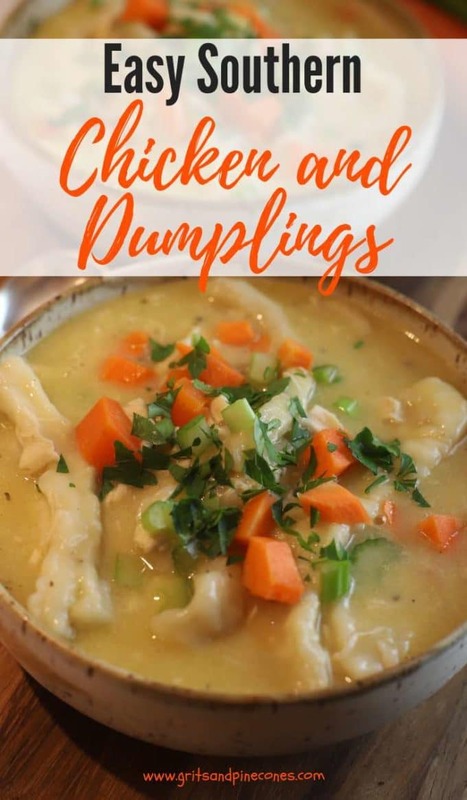 It’s full of juicy pieces of chicken and tender, plump dumplings swimming in a delicious, hearty broth with carrots and celery thrown in for good measure. But wait, I know what you are thinking; this sounds good Sharon, but I don’t have the several hours it would take to make this old-fashioned dish from scratch! Well, what if I told you that with a little help from a rotisserie chicken and a can of refrigerated biscuits, you could have a ridiculously good bowl of Easy Southern Chicken and Dumplings on the table in about 30 minutes? Are you interested now? The best Chicken and Dumplings? This is not the homemade Chicken and Dumplings from scratch that your mother or grandmother used to spend all day making. And, I am not claiming that this quick and easy recipe rivals theirs. But what I will say is Easy Southern Chicken and Dumplings is nothing short of a dream, it’s quick to make, and it will be even quicker to disappear. Let’s talk dumplings! Depending on what part of the country you grew up in, you might prefer large fluffy biscuit dumplings or the flatter strips of biscuit dough cooked in broth until they are puffed and tender. 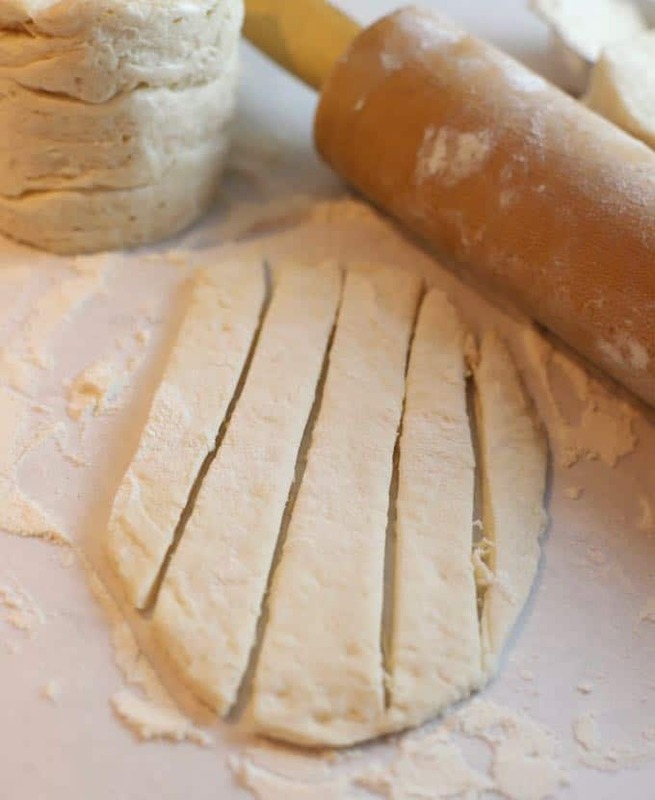 Instead of making the dumplings from scratch, this recipe uses refrigerated canned biscuits, which are simply flattened and then cut into strips. So, flat it is! 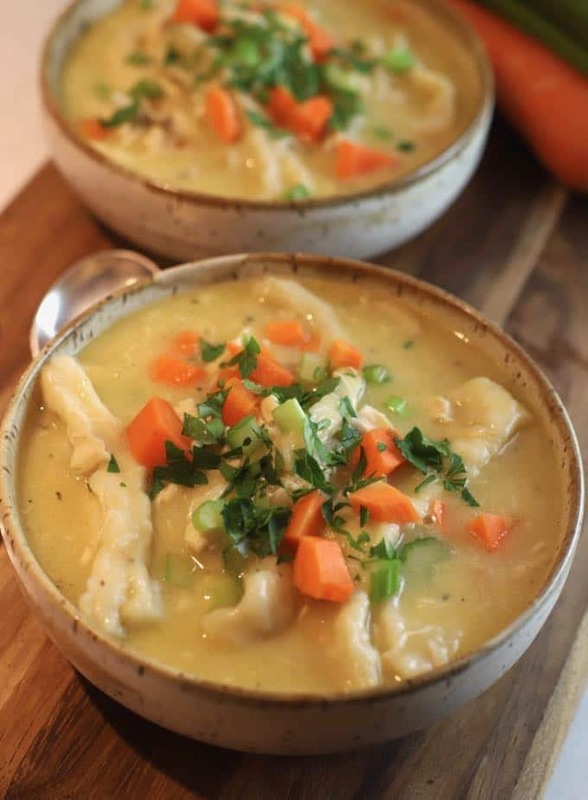 Many Chicken and Dumpling purists don’t believe in adding any vegetables to the broth, arguing that all you need is chicken and the dumplings. I think the carrots and celery add a nice crunch and flavor, not to mention a few vitamins and minerals, so I like to include them, but you decide. Leftovers, if you have them, should be stored covered in the refrigerator. According to my husband, leftover Easy Southern Chicken and Dumplings is just as good, if not better, the next day. Easy Southern Style Chicken Divan. 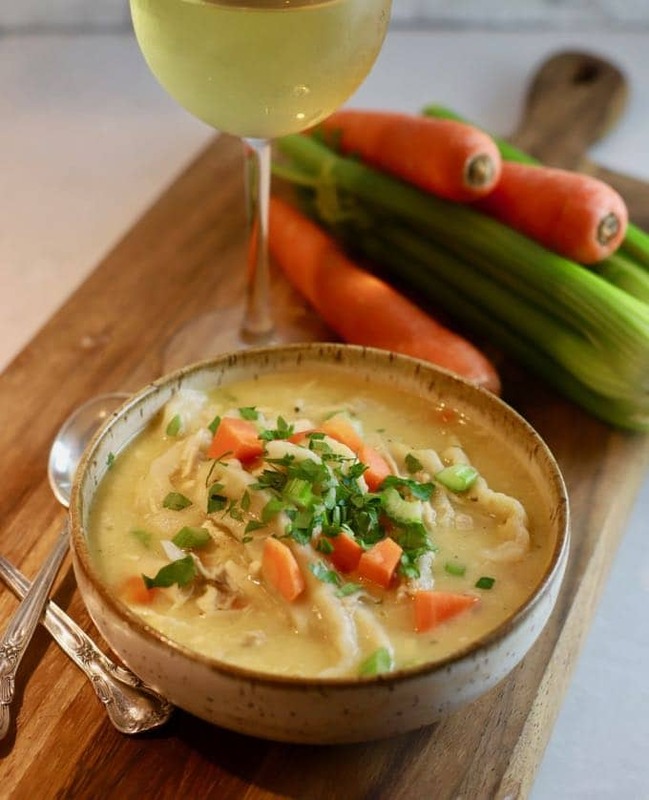 We have some cold weather headed our way this weekend, so let’s get down to the business of making Easy Southern Chicken and Dumplings to help ward off the chill! 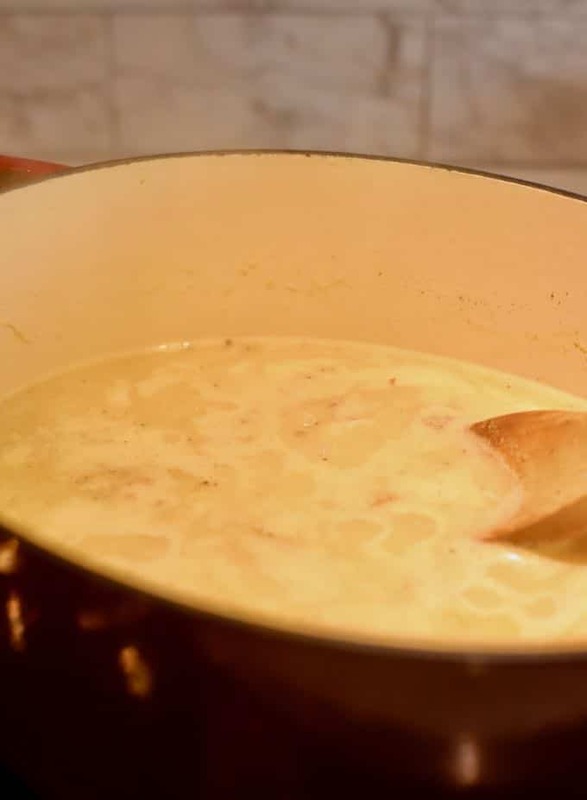 Add chicken broth, chicken, soup, and poultry seasoning to a large Dutch oven over medium-high heat. Bring to a boil. Reduce heat to low, cover and simmer for 5 minutes. While the chicken soup mixture cooks, roll out or pat six biscuits to 1/8-inch thickness on a lightly floured surface. Cut each biscuit into 1/2-inch-wide strips. Remove the lid from the chicken mixture, increase the heat to medium-high and return to a boil. Drop the biscuit strips, one at a time, into the boiling chicken mixture. Once all of the biscuit strips have been added, add the carrots and celery. 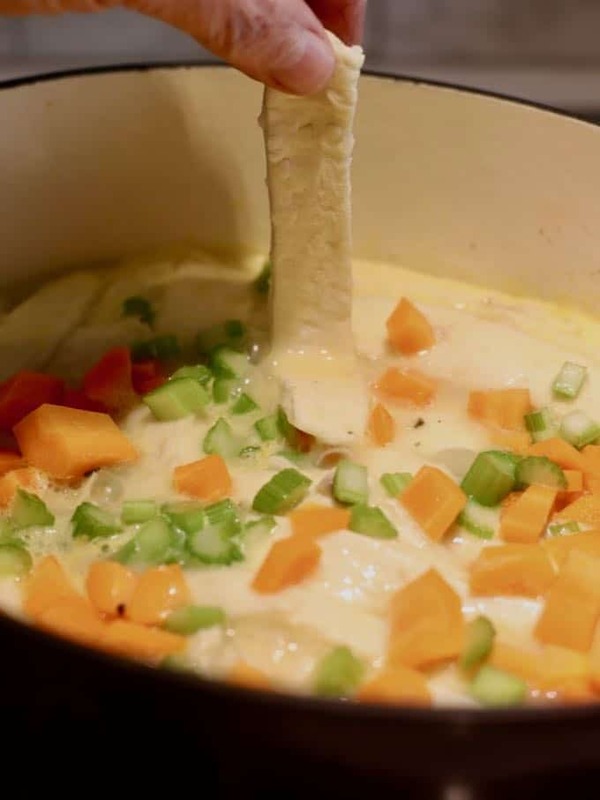 Reduce the heat to low, cover, and simmer 20 minutes. Stir gently every 5 minutes to keep the dumplings from sticking to each other. Ladle into a bowl and serve immediately! Garnish with chopped parsley if desired! Instead of boxed chicken broth, I like, and use jarred, Better Than Bouillon Roasted Chicken Base, which is mixed with boiling water to make chicken broth. Each 8 oz jar makes 38 cups of broth. There are eight biscuits in each can of biscuits, and I find that this recipe works best if you only use 6. Bake the two remaining biscuits and serve them with another meal. A pizza cutter works better than a knife for cutting the strips of biscuit dough. If so, please rate it and let me know what you think in the comments section. Also, take a picture, post it on Instagram and tag @gritsandpinecones, and hashtag it #gritsandpinecones. I love hearing from you and seeing what you have made! Easy Southern Chicken and Dumplings is classic comfort food and a true family favorite. 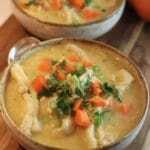 It's full of juicy pieces of chicken and tender dumplings swimming in a delicious broth with carrots and celery thrown in for good measure.